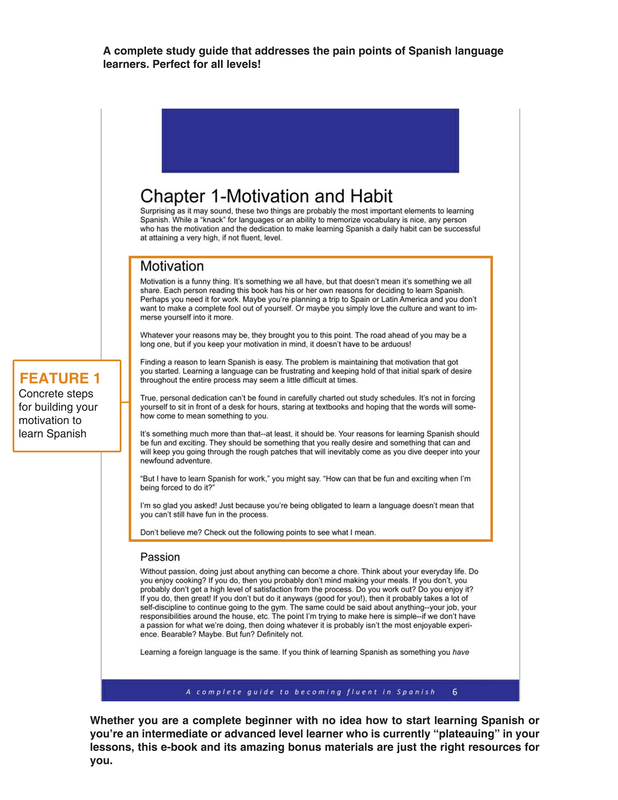 Build your motivation with proven methods to help you keep learning Spanish until you reach fluency. Speed up your learning: learn shortcuts and hacks specifically for learning the Spanish language. 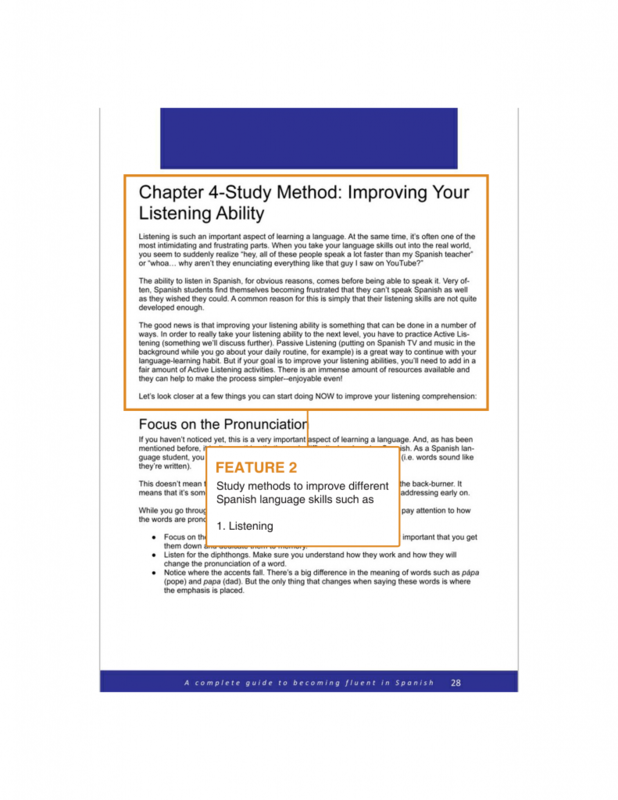 The only study guide with bonus audio: practice your listening skills and your Spanish pronunciation with the help of bonus audio materials. 3 formats available: Read it on your tablet, computer, or e-reader. 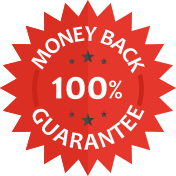 BONUS MATERIAL: get a free study plan tailored to you, based on your level and the amount of time you can invest in learning Spanish each day. Only US$19.90 or the equivalent in your currency. Are you planning to learn Spanish but don’t know where to start? Do you feel like you do not have enough time and motivation to learn Spanish? Or have you been studying Spanish for a while but cannot see any improvements? If you find yourself saying “yes” to any of the questions above, then you definitely need a study guide for learning Spanish. If not addressed immediately, these questions and concerns can cause you to become demotivated in learning Spanish, and some will eventually abandon their goals for learning Spanish. You can avoid all that with a guide to help you along the way, whether you are a complete beginner, at an intermediate level, or an advanced learner. 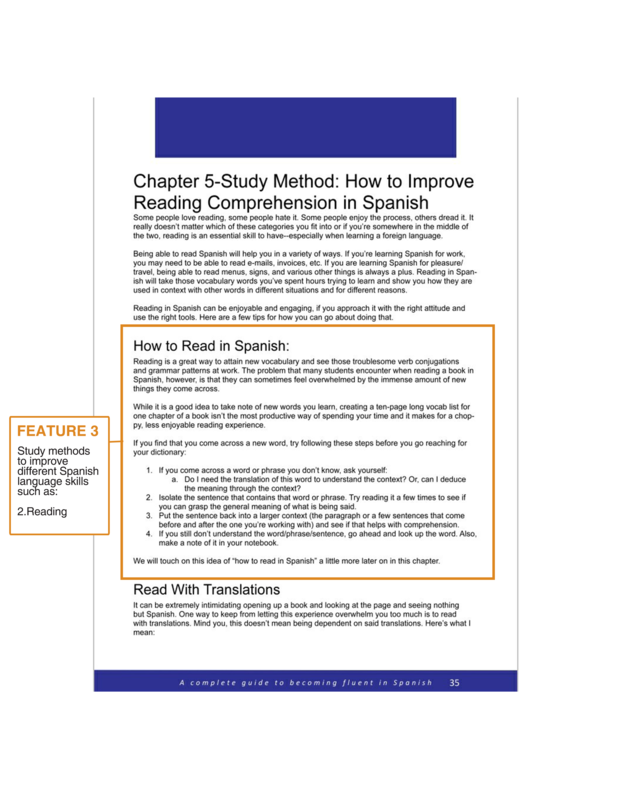 It’s a study guide for all levels which will organize the way you study Spanish and help you develop an approach to learning Spanish. This is not a textbook that will teach you grammar concepts or new vocabulary. Whether you’re just starting to learn Spanish or you have been studying it for some time, proper motivation is needed to keep you going. This book will teach you how to build a learning habit that will keep you motivated to learn Spanish effortlessly every day. You will also learn how to turn Spanish-learning into a fun activity to suit your personality type and interests. There are a lot of myths about language-learning, specifically learning Spanish. 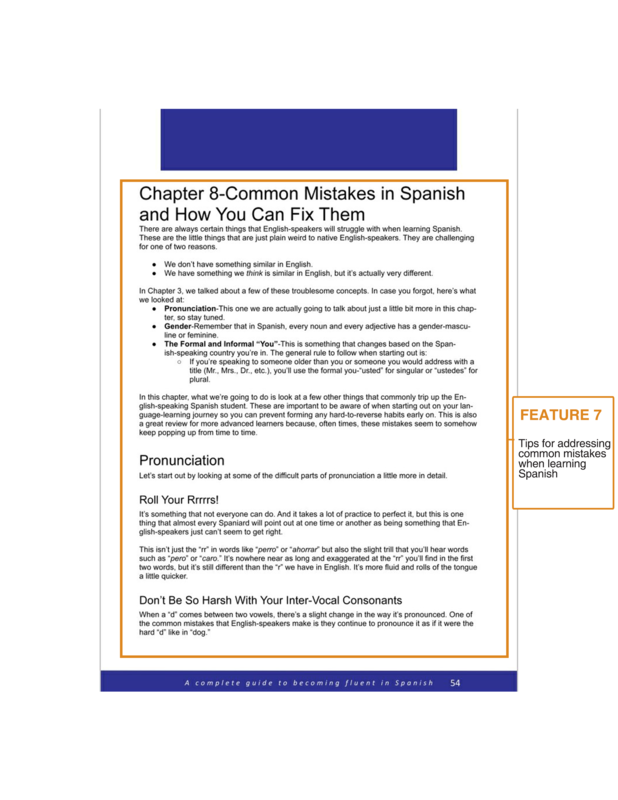 This book will help you identify them and help you address the most pressing issues and mistakes commonly faced by learners of Spanish. Whether it’s effective study methods to improve your listening skills or tips to make the best out of reading in Spanish, this book will help you accelerate your learning process. 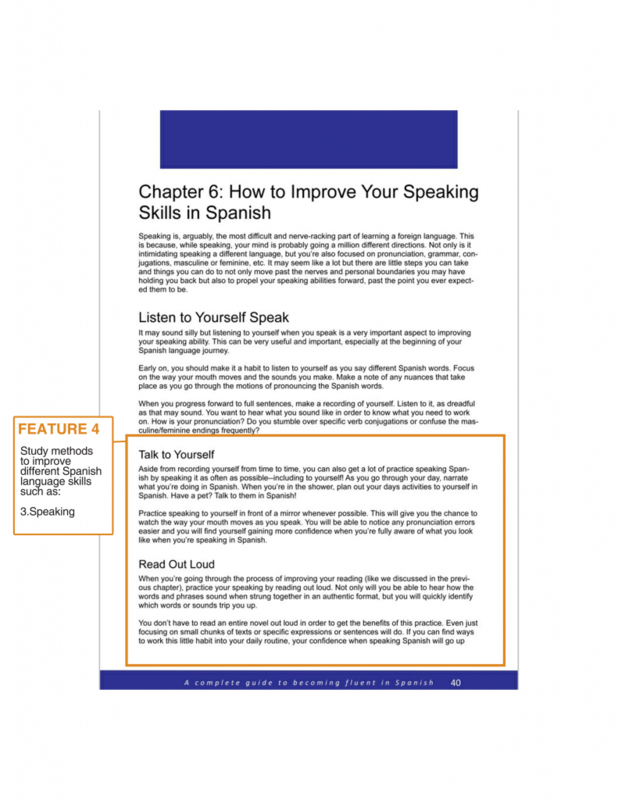 You will also learn top ways to speak, sound, and write better in Spanish. Aside from these, you will also learn awesome hacks that will save you time and energy in learning Spanish. …this book is written for you. This study guide has original useful techniques and tips you can use to enrich your vocabulary and get you on track in learning Spanish, regardless of your level or situation. 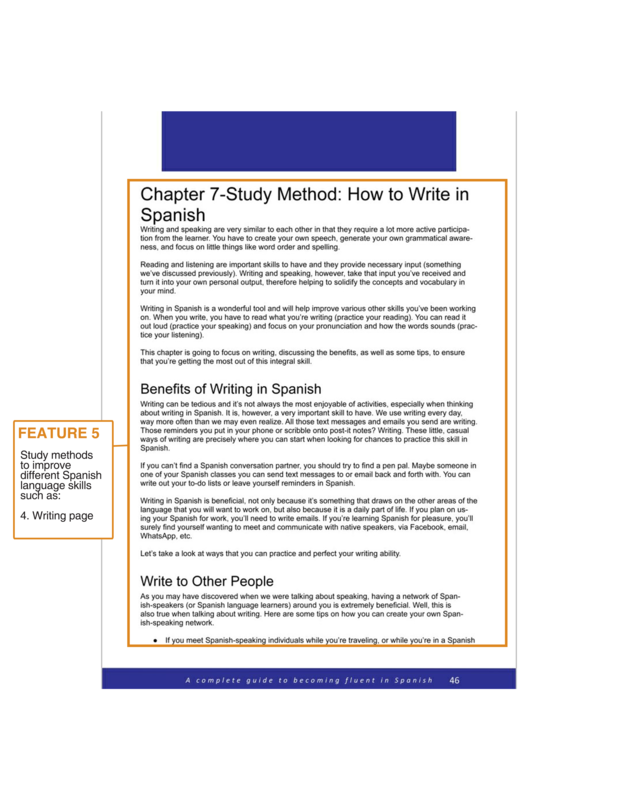 Aside from the items mentioned above, there’s one more amazing freebie that comes with your purchase: a study guide based on your level and the length of time you can commit to learning Spanish daily. So whether you are a beginner with a super busy schedule or an intermediate level learner with an hour to spend each day, the study plan will tell you which lessons to prioritize every day! No more excuses! Regardless of how busy you are and what level you are at, the study guide will help you squeeze in just enough time to help you learn Spanish each day, and in the process, you’ll be able to create a daily learning habit that sticks with you until you reach fluency. I studied Spanish for a year in high school and although I built up a solid base in vocab and grammar, my language was nowhere near usable in everyday life. As an undergraduate student I don’t have time in to devote to a formal language class, and although apps including Duo Lingo serve as good practice, the lack of a language learning schedule makes it hard to stay on track. By centering each chapter around a specific point of concern common to any language learner (e.g. improving speaking skills, vocab memorization) and then addressing them in a simplified way, this book has been a great instructional resource for structuring my language practice. It’s simple, practical, easy to understand, and can be read chapter by chapter as time permits. With tips and tricks that can be integrated into a busy lifestyle, this book is ideal for structured yet casual language accumulation. I bought this ebook because I needed to perfect my Spanish for my job. I learned a lot (vocabulary and my usual errors). We can progress in the Spanish language with this ebook without any doubt, I strongly recommend it. This is the most comprehensive tool guide to learning Spanish I have come across thus far! This book gives you great resources to assist in learning Spanish. The material is condensed in a way that’s easy for the reader to follow yet descriptive enough to be beneficial. This is a great resource to have on hand as you learn this language! I brought this so I can make my Spanish language stronger, I’m trying to get a job a a translator since I know three languages. This by far is the best Spanish book I brought. Has very great material and I enjoy learning for it. -Very motivating and inspiring book.Each chapter nudges the reader to go on reading it. I expected this book to be like any other Spanish learning book that focuses on grammar and vocabulary and all the basics. However, it is exactly what it is – a guide book. 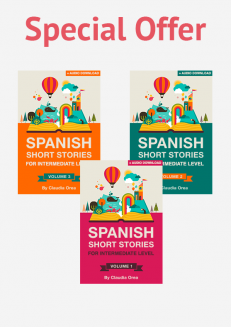 It aims to address the common mistakes Spanish learners make, and to help them develop the best practices and habits to learn the language more effectively. Although there are still vocabulary and grammar sections included in this book, this alone will not be enough to make someone fluent in Spanish. But what’s great about this is that it caters to every learner in any levels. Whether you’re a beginner, intermediate or advanced Spanish learner, this is a really helpful companion book to supplement your studying. I would definitely recommend this to anyone who wants to improve their Spanish. I really liked this book. It has helped me to develop my Spanish skills in an effective way with valuable methods. This was my final book I used to read and brush up on Spanish before my trip back to cancun and I am very satisfied with the formality it covers everything I missed in my previous readings in regards to grammatical rules as well as context building. The book allowed me to review through so many stories which were hard to read and took many tried but also gave me a good grasp of conjugation of special types of words over time. This book also allowed me to work on my listening as well as my writing and speaking to make me an all round better speaker and through this experience I was able to talk to natives with no problems so I highly recommend this book to anyone. I am in my fourth year of studying Spanish and this book has helped me to be more confident in my speaking skills by giving pointers on how to improve how I say things and so much more. It is so helpful! I’m happy thay my spanish studies finally can take place 😀 This book gives you a new perspective of Spanish, breaking down the fear of Spanish grammar and pronunciation. Nice bonus material! 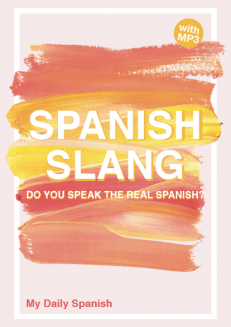 I come from a Hispanic family and I want to communicate with them effortlessly in our mother tongue to feel closer to my roots, and this ebook is helping me achieve my goal. It motivated, inspired and gave me many useful tips. I would recommend this to anyone who wants to polish their skill in the spanish language. 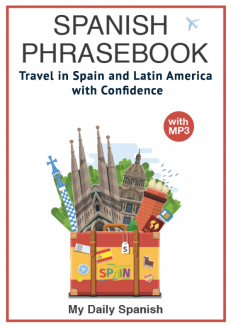 A very valuable resource for learning Spanish! This book has been a lifesaver! I’ve always had trouble with conjugations in Spanish, but now I truly have a better understanding. Its a much better guidance book than any other I have come across, and a great guide to hot to motivate yourself. I highly recommend it to anyone trying to learn the Spanish language. This book whets your appetite and curiosity for learning Spanish. It provides a really useful guide that, includes learning techniques, strategies and lots of resources. As a Beginner, I really like that it is written from a learners’ perspective and with plenty of ‘Aha’ moments, it felt tailored to my needs. I would recommend this book to anyone who, thinks learning a new language is difficult or learners of all levels who simply want to become more ‘Fluent in Spanish’. Great for beginners who are trying to start a daily learning habit! I liked the book, most of the methods apply to learning any language. this book has been instrumental in helping me form the habits necessary to work Spanish language learning into my everyday life. I love it! 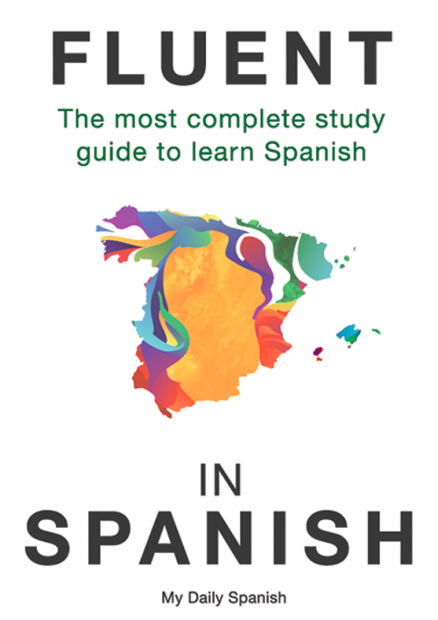 This book teaches Spanish and also how to become more fluent in Spanish after learning it. It has conjugation, grammar, speaking, and extra things like colloquialisms and abbreviations. It’s a good source for anyone who wants to learn this language! I found this book really helpful, in terms of showing me different ways to develop good practice habits. The hyperlinks to cultural resources (I’m big into books and films) gave me better options for study than other books and classes I’ve taken. I definitely wish I’d gotten this book along with something more traditional. This book gave me good ways to learn Spanish, but I personally also need things like vocab lists to help me learn. Overall though, I loved this book. Would definitely recommend! A helpful reading, I liked the tips on how to maximize the learning experience. This book is so helpful with learning Spanish! It really helps with understanding the language in depth and correct conjugations and pronunciations. If you are new to the language or only know the basics, I would definitely recommend this book to you to help you learn more or brush up on this topic.